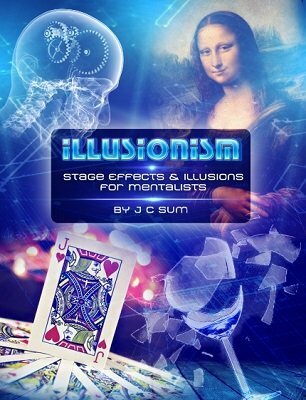 From the author of the internationally critically acclaimed Urban Illusions, Illusionary Departures books and the producer of the best selling Behind the Illusions DVD comes a first-of-its-kind ebook dedicated to professional illusions and large-scale stage routines for mentalists and mental magic presentations. Professional illusionist & illusion designer J C Sum details eight original illusions and stage routines for mentalism shows, complete with full presentations, full-colour illustrations and building plans. Download the free sampler right now. The routines offer an alternative fresh perspective of presenting mentalism. They also demonstrate how illusion methods and principles can be combined with mentalism methods to create unique stage routines. The ebook also explores how visual production value and scale can be a valuable addition to a traditional minimalist mentalism show. Who will benefit from this work? A large-scale visual opening prediction revelation that opens a show with a bang and establishes the nature of a mentalism show. A three-phase telekinesis routine with a spoon, block of wood and wineglass. A secretly chosen wineglass from a number of glasses shatters upon concentration. A stage routine that involves giving spectators a chance to win your paycheck for the show. As a kicker finale, the paycheck transforms into a large box full of money! A lighthearted comedy mentalism routine that involves a spectator being shackled to you! A powerful climax for Fogel's signature routine. A prediction routine involving a choice of the latest fashion apparels with a sealed prediction in a large isolated glass box that ends with a logical illusion kicker! All the routines, except for "Fashion Statement", can be performed by the solo performer. Basic illusion knowledge is not necessary to understand the illusions in this book. However, illusion and illusion building knowledge is required if you intend to build some of the illusions yourself. If not, any illusion builder or stage prop maker will be able to build the illusions for you. Also included is the explanation to J C's "Developmental Force" that is a devious enhancement to the "Magician's Force" with playing cards or envelopes. Check out the sample pages more insight and details into this incredible one of a kind book! 1st edition 2012, 50 pages.